Premium cutting tool from Golem Gear. 4" MiniShears. As an alternative to the Hogarthian knife, open water divers carry shears for cutting through wire leaders and nets. Razor sharp, surgical stainless steel blades with one serrated edge to cut through the toughest materials. The molded handles will not twist or break. The heat-treated surgical stainless steel blades stay sharp without re-sharpening. They will not rust or corrode . Simple, yet very efficient. About the same size as hogarthian knife. 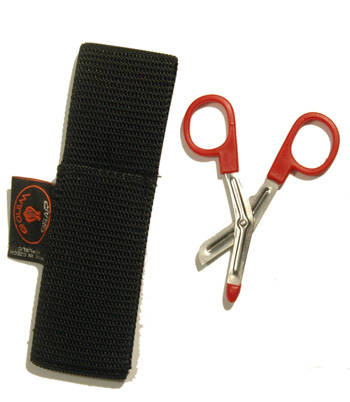 The shears include a waistbelt webbing sheath pouch with 2" belt loop.